The kitchen of the La Plage Resort focuses on the philosophy of a “Fusion” restaurant, where Mediterranean flavours and traditions blend with the natural and intimate style of Sicilian cuisine. Fusion cuisine is the fusion of gastronomic traditions and the combination of recipes and culinary experiences that make the meal a pleasant, rewarding and, above all, memorable experience for the palate. The culinary philosophy of the Fusion restaurant of the La Plage Resort brings life to a new type of creative cuisine, whereby the Chef is transformed into an artist and designer of his own dishes. Many of the dishes created are true sensory storms for both the palate and the nose and are impossible to forget. 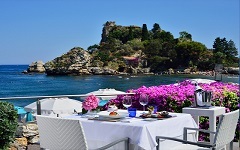 Having dinner or lunch at the Fusion restaurant, embraced by the sea breeze and walking barefoot on the Isola Bella sea shore, is an unforgettable experience.